A church memorial to Cherry-Garrard, his grave and his home. Episode: 1. Site Numbers: 003 & 156. Date Posted: 30 March 1996. Update 10 March 2000. Location: Wheathampstead and Ayot St Lawrence, Hertfordshire, England. Type: Memorial, Grave & Building. Apsley G. B. Cherry-Garrard (1886-1959), assistant zoologist on Scott's Last (Terra Nova) Expedition is buried at Wheathampstead, Hertfordshire, England, just north of St Albans, an easy day trip from London. In the lovely parish church of St Helen's is a bronze statuette of Cherry-Garrard in a niche in the north transept (003). The sculptor was by Ivor Roberts-Jones. I first learned of it from a short mention and photograph on page 68 of the May 17, 1986 issue of The Field. Below the standing figure of "Cherry" (depicted in polar clothing) is a carved stone plaque that reads: "Apsley George Benet Cherry-Garrard Born 2 January 1886 Died 18 May 1959 Explorer Antarctic Expedition 1910-1913 Author of The Worst Journey in the World." Finding Cherry's gravesite turned out not to be an easy task. Searching throughout the large churchyard I finally found it, where else but in the very last section, the far northwest corner. The inscription on the side away from the church reads: "In loving memory of Apsley George Benet Cherry-Garrard of Lamer Park, Wheathampstead. Only son of Major-General Apsley Cherry-Garrard. Born 2nd January 1886 Died 18th May 1959. Also Margaret Ursula Cherry-Garrard daughter of Major-General Apsely Cherry-Garrard Born 1896 Died 1979." Cherry-Garrard accompanied Bowers and Wilson on that 'worst (mid-winter) journey' to Cape Crozier to retrieve Emperor penguin eggs. It is one of the great tales of polar hardihood and perserverance in the name of science. His book is generally accepted as a classic of Antarctic literature and, alone amongst the genre, has been in print continuously since its issuance in 1922. Not far off is the tiny village of Ayot St Lawrence, famous mainly as the home of George Bernard Shaw (whose house, Shaw's Corner, is open to the public). 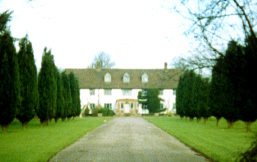 The Garrards lived at Lamer House (156) outside the village. Cherry's father was a General in the British Army. Introduced to Scott by Wilson, Cherry was so keen to go south that he donated a thousand pounds to the expedition's coffers. No longer owned by the family, the house, which apparently replaced a far grander original, still stands and makes a nice visual diversion if one wishes to make the pleasant walk from Ayot back to Wheathampstead (as I did). It was Shaw who, in a sense, was responsible for the title Worst Journey in the World after Cherry came to him in a quandry: "What shall I call this book?" he asked." It was the worst journey in the world but I can't come up with a title." "That's it!," Shaw (probably) exclaimed.